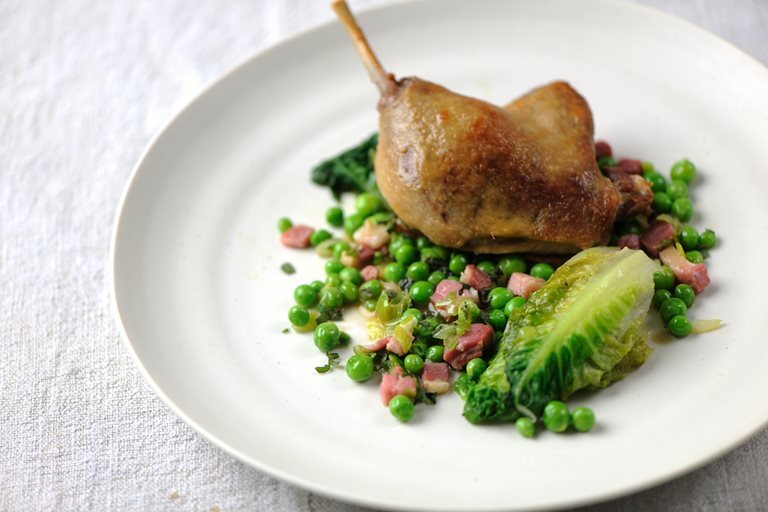 In this colourful duck recipe by Dominic Chapman, the sweetness of peas and freshness of lettuce intriguingly contrast with braised duck leg and delicious bacon. Onions, mint and thyme bring extra flavour to this beautiful dish. To braise the duck legs, heat a little vegetable oil in the base of a large pan on a medium to high heat. Add the onions, thyme, bay, salt and garlic and sweat for 5 minutes. Add the duck legs and enough chicken stock to cover.